Be sure to flip through the Holiday 2015 edition of Hamptons Cottages and Gardens this month to see some of Marshall’s furniture pieces for Edward Ferrell + Lewis Mittman in a feature focused on American furniture icons in design. 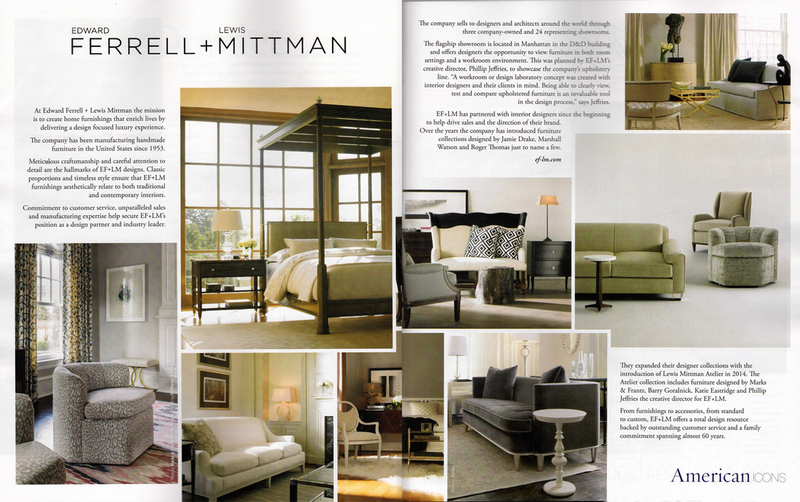 Highlighted in the spread are a number of Marshall’s favorite pieces from both of his collections including the Lancaster four poster bed and Pitcher sofa. Also featured in this month’s issue are photos from the panel discussion sponsored by Cottages and Gardens Magazine for the D&D Fall Market event in October. Marshall was interviewed alongside designers Eric Cohler and Mary Foley about what defines American design, how it has inspired them, and how important of a role it plays in their work.